How to transfer videos / photos / podcasts to the Walkman using Content Transfer? How to transfer videos / photos / podcasts to the Walkman using Content Transfer. You can transfer videos / photos / podcasts by drag-and-drop of the desired and compatible files from Windows Explorer to Content Transfer. 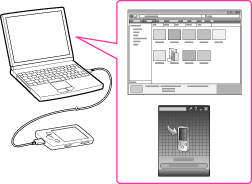 Connect the player to your computer using the USB cable (supplied). Insert the connector of the USB cable into the player with the mark facing up. Content Transfer starts automatically. For details on setting automatic start and general operation of Content Transfer, refer to the Help of Content Transfer. You can also click All programs in the start menu, and then Content Transfer - Content Transfer to start the software. Select the desired videos / photos / podcasts from Windows Explorer, and drag-and-drop them to Content Transfer. Content Transfer recognizes the type of data by filename extension, and sends it to the appropriate folder of the player. Do not disconnect the USB cable while Do not disconnect message appears on the player, as the data being transferred or the data stored in the player may be damaged. Please check the instruction maunal of your model for playback compatibility. Contents with copyright protection cannot be transferred. If you drag and drop podcast episodes from Windows Explorer to Content Transfer, the episodes will be transferred to the MUSIC folder or VIDEO folder in accordance with their file type. To transfer episodes to the PODCASTS folder, directly drag and drop to the PODCASTS folder using Windows Explorer . If you drag and drop episodes from iTunes to Content Transfer, they will be transferred to the PODCASTS folder. How to convert video to WMV format for playback on the WALKMAN using Content Transfer? Can Android Walkman play podcasts? How to share photos or videos from iPhone or Android device to the Android TV?